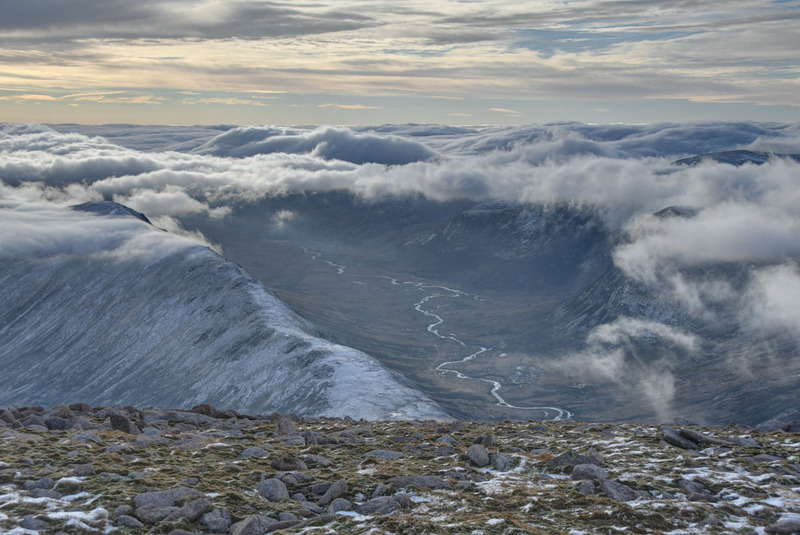 Cairngorms inversion. 5th January 2019. 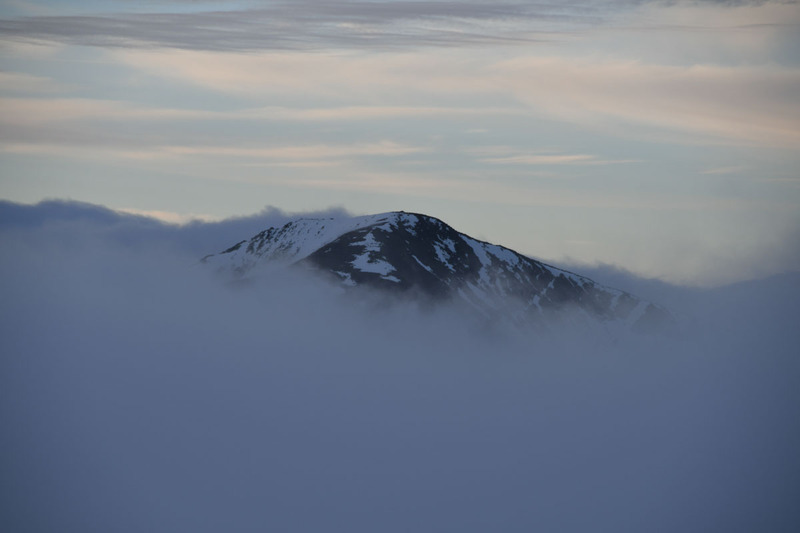 The 2nd of January had seen us on Binnein Mor, under cloud. 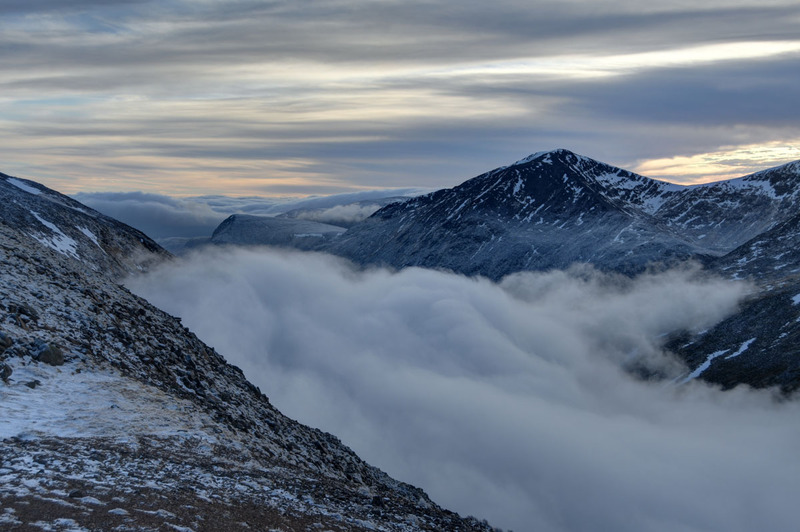 Subsequent pictures of Ben Nevis above the cloud were a little irksome. 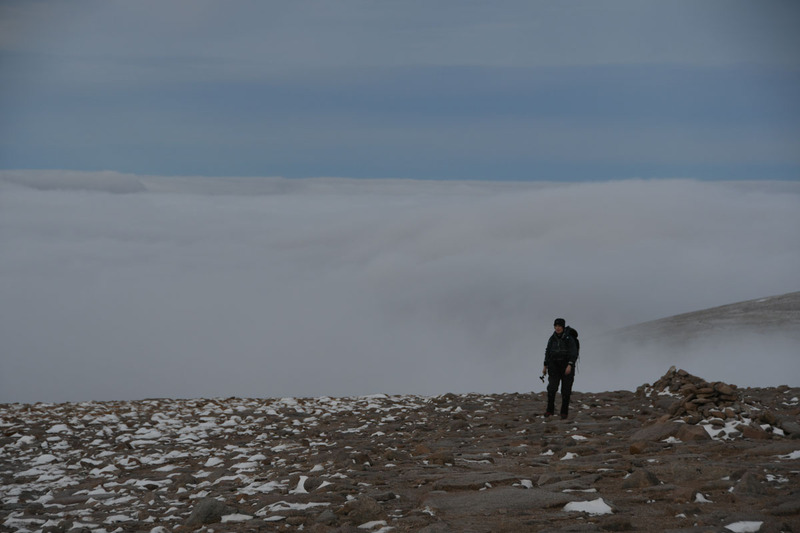 Saturday had another forecast suggesting that the higher peaks might be above the clouds – this time we decided to maximise our chances and head up onto the Cairngorm Plateau. Kicked off from the Ski car park at 0740 – a bit over an hour til dawn. Headed up the access road, and then the path up Fiacaill a Choire Chais. Into the cloud at 900m, with occasional glimpses of sky above we were hopeful of getting above the inversion by the cairn at 1141m. 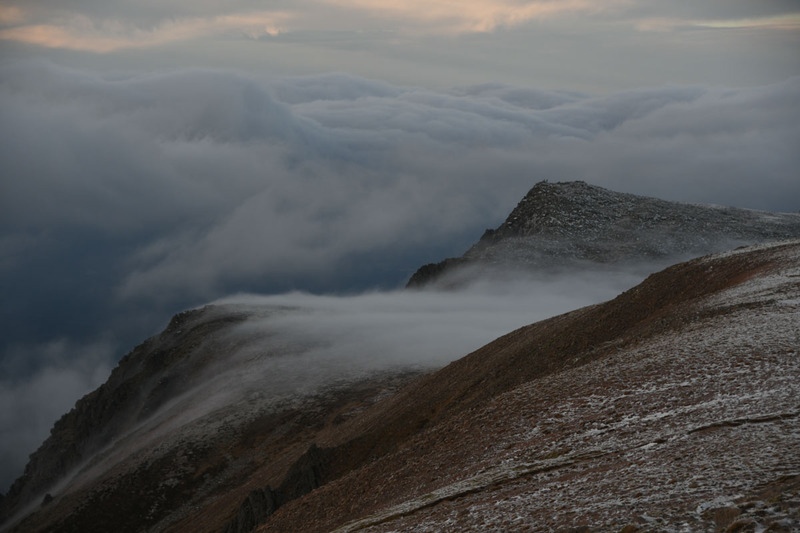 On the worrying side the forecast wind speeds had increased – previous experience suggested that might make for a choppy, flowing inversion with a tendency to push over the hills. 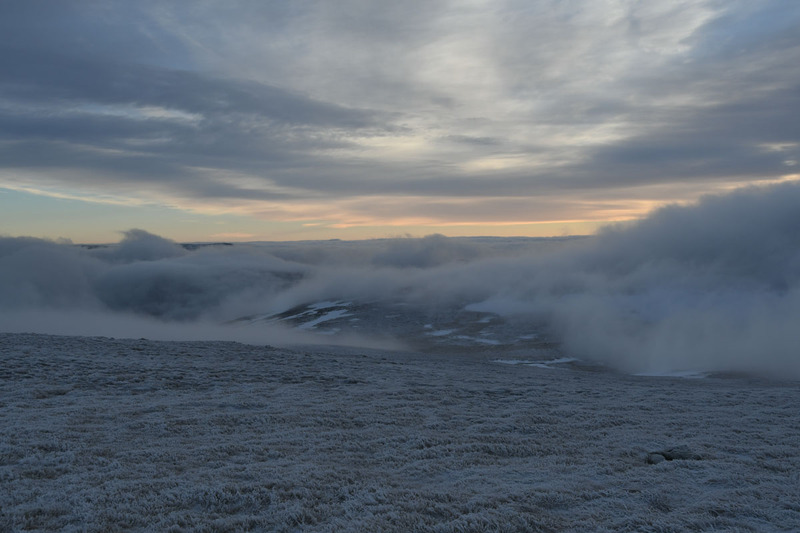 Up to the cairn before dawn, but still in a flowing mist layer. 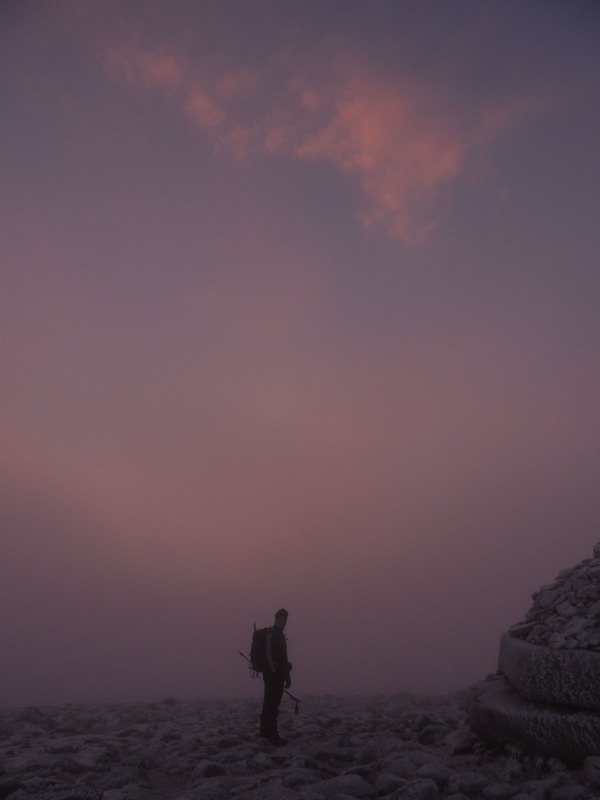 Still, it was a rather unusual pink haze that we were in as the sun came up. 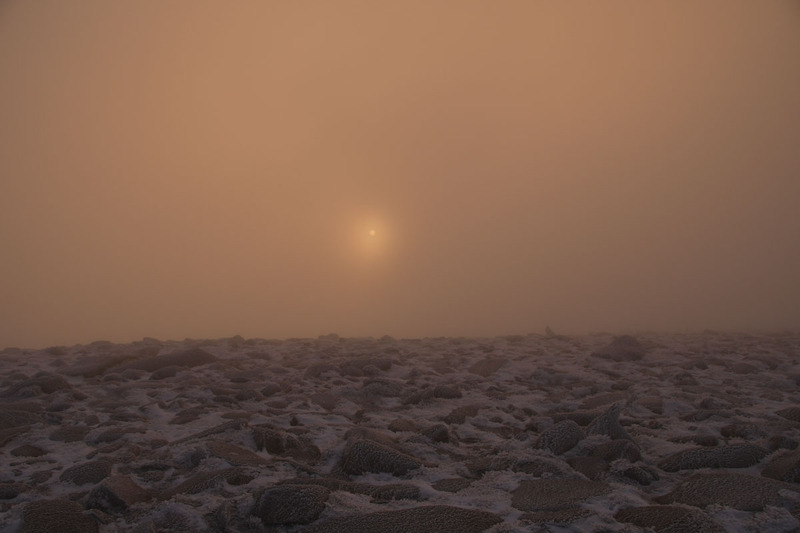 We headed over to Stob Coire an t-Sneachda, in mist all the way – the sun was visible through the mist to the SE. 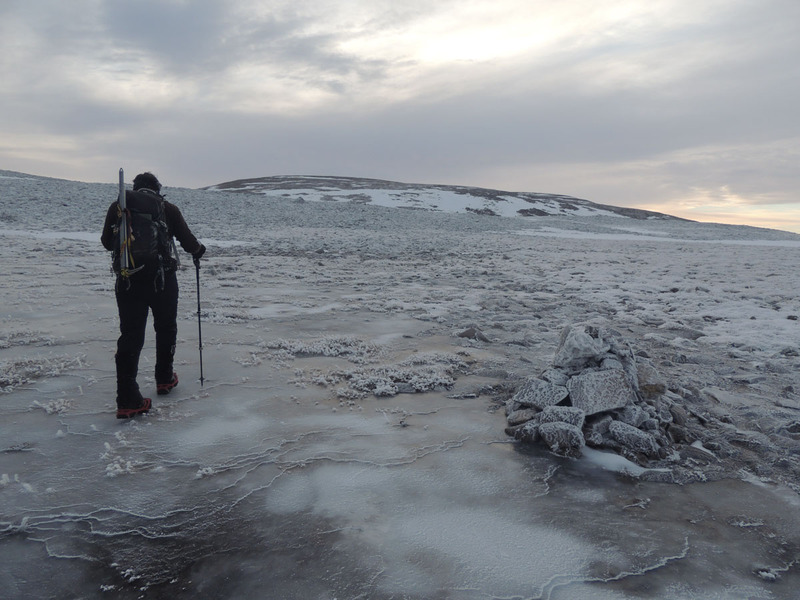 Headed on and up Cairn Lochain – the light dimmed suggesting the sun was behind higher cloud. 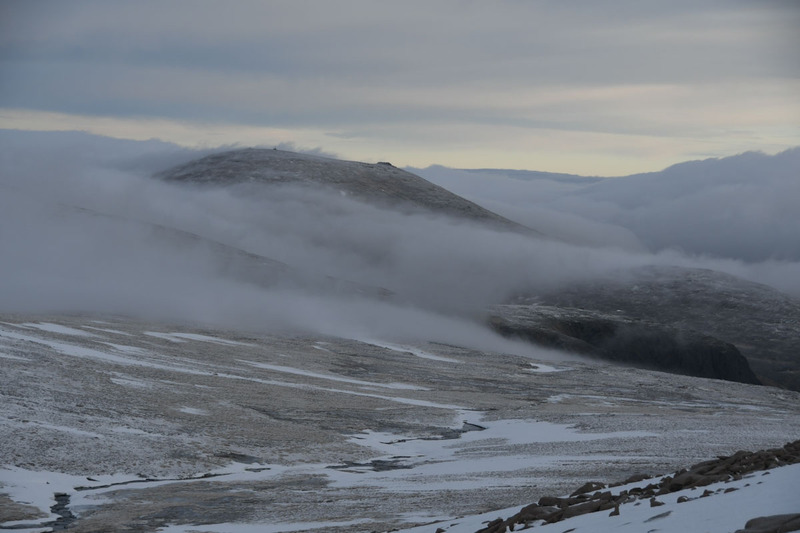 Continued SW in the mist to head over towards Ben MacDui, ‘Gorms in mist are an unusual Scottish Hill environment – flat and featureless. Eventually we emerged from the mist, indeed the sun had moved behind clouds leaving an atmospheric looking world. 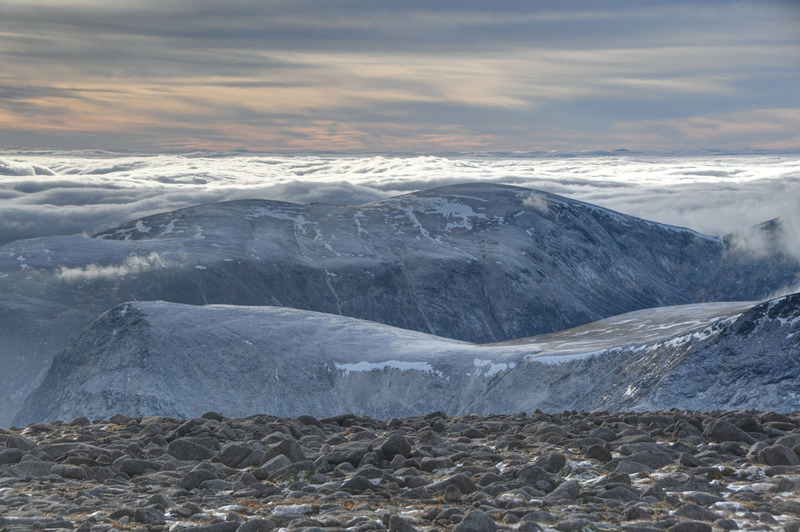 Across Lairig Ghru Cairn Toul was above the clouds. The path to MacDui was almost snow free. 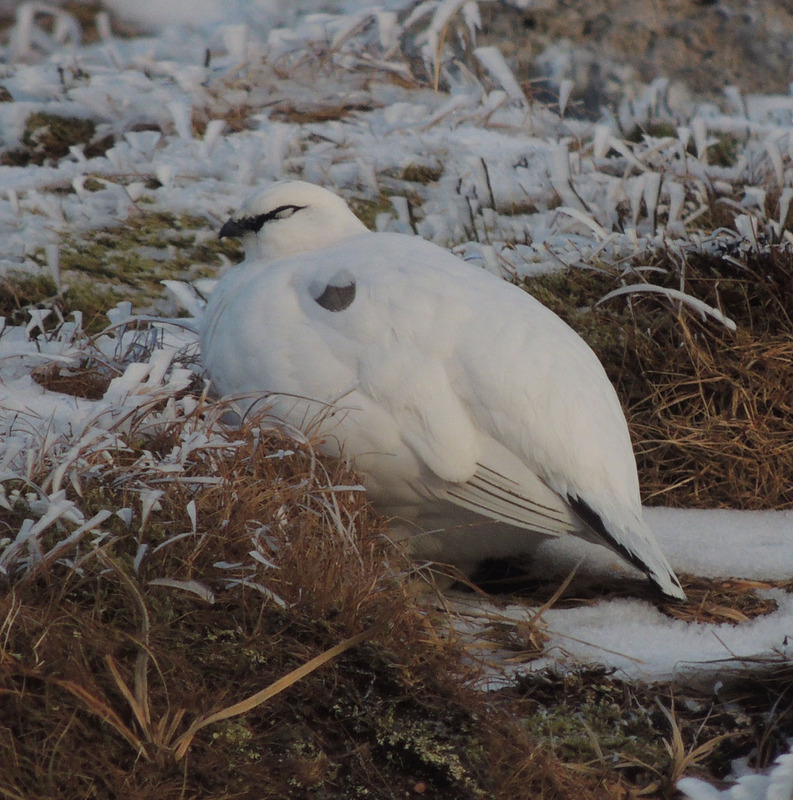 With boulders clad in hoar frost and stretches of ice it was ideal microspike territory. Wandered on along our favourite ambling territory. The ‘Gorms are great for wasting away a day. Here and there hills were wreathed in mist. 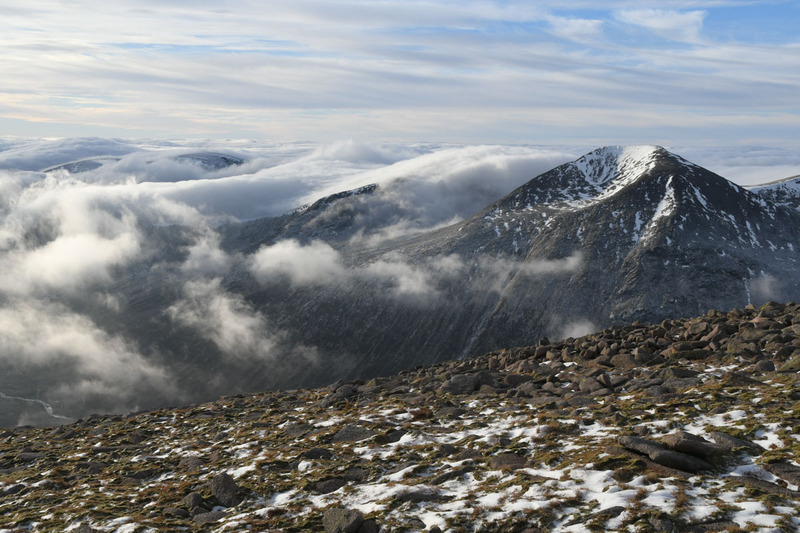 There was definitely a trend towards clearing….across Lairig Ghru the western chain of munros always looks tasty. A bit grey it might have been, but still a great day to be out. 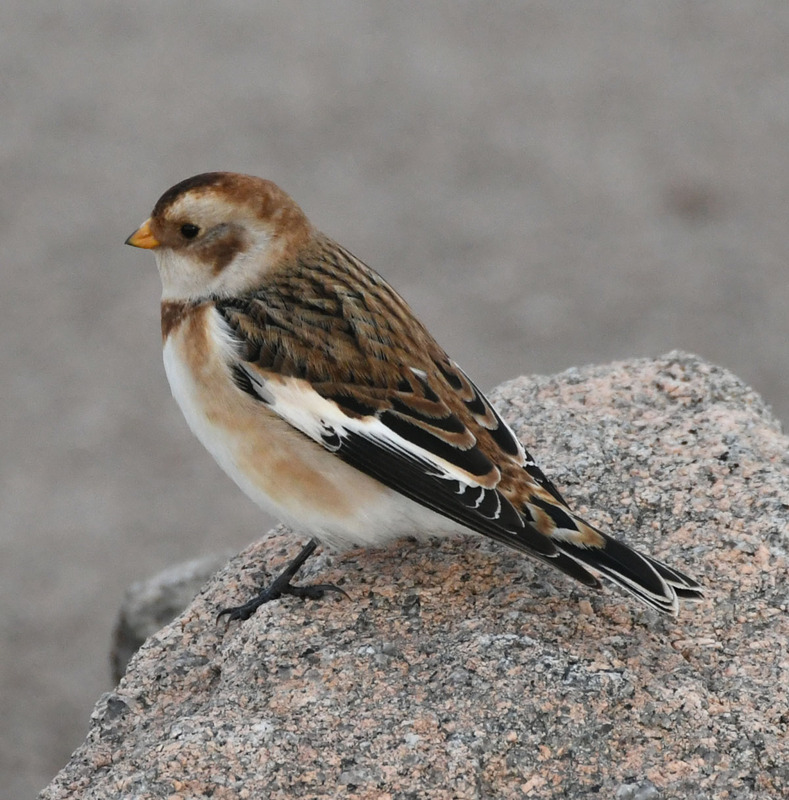 Up to the summit of Ben MacDui and the snow buntings were in attendance, probably looking for crumbs. There’s usually a few up here. 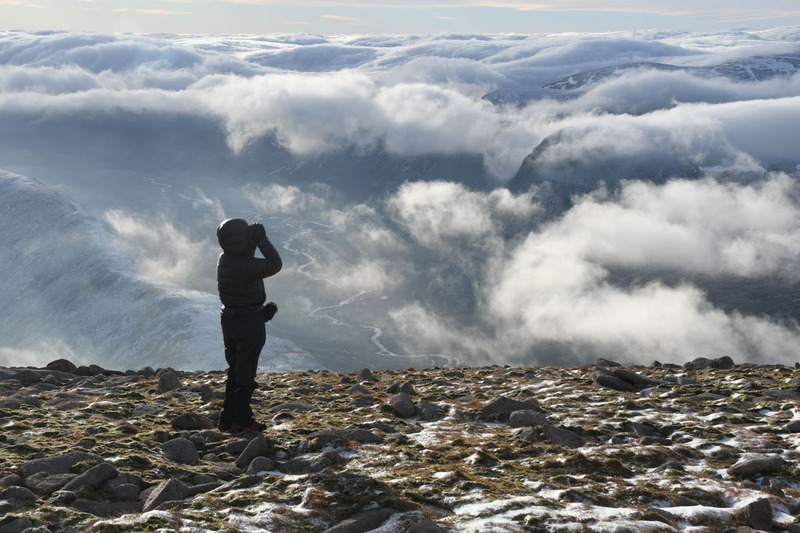 As is our habit, we headed a bit south from the summit to get the view down into the southern Lairig Ghru and then had some lunch. Sat around for about 45 minutes as the clouds and layers swirled. 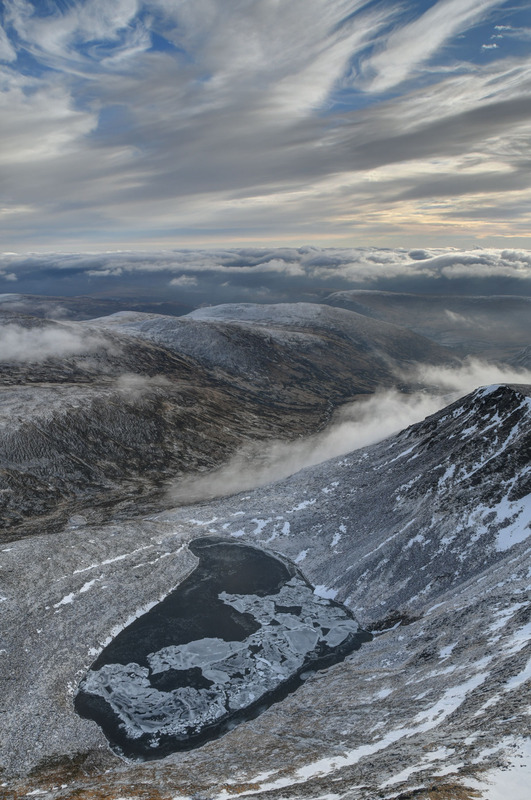 It’s a fine place to sit around – the view down to Carn a Mhaim and Bod an Deamhain is superb. 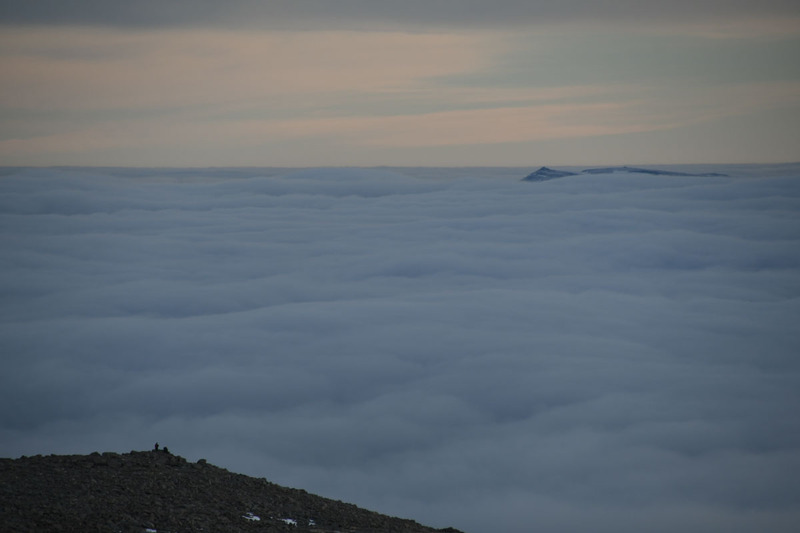 Not many hills were obvious above the inversion, as expected a bit of a choppy one. 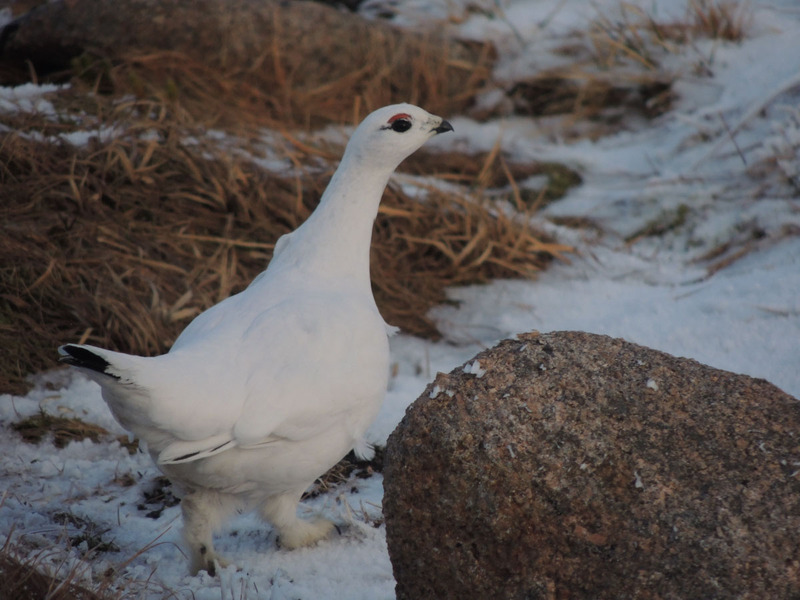 Lochnagar occasionally poked up enough to be seen. Some cloud moved eastwards giving us a little direct sunshine, and a rather bright sundog too. 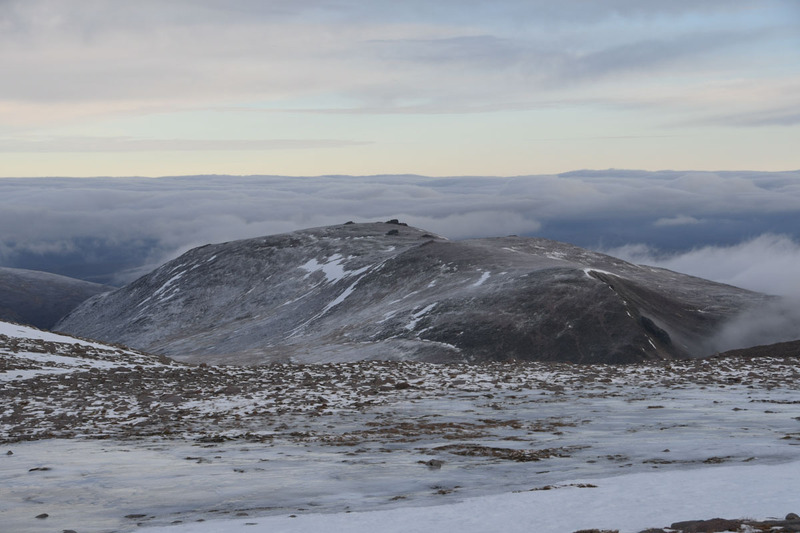 We could see walkers with a greater work ethic than ours over on Cairn Toul and Sgor an Lochain Uaine – a big day. We just mooched around and enjoyed the view. 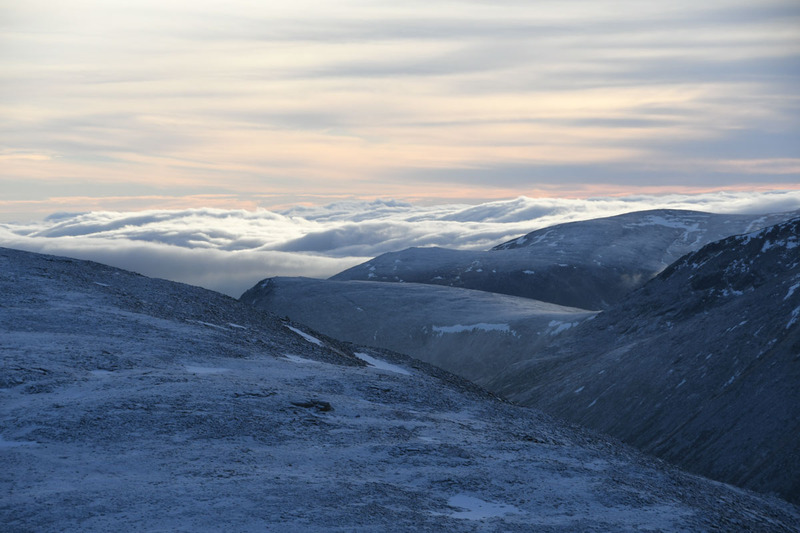 Decided to head across to Stob Coire Sputan Dearg and our oft used camp site. Not in a rush to head back on such a nice day. 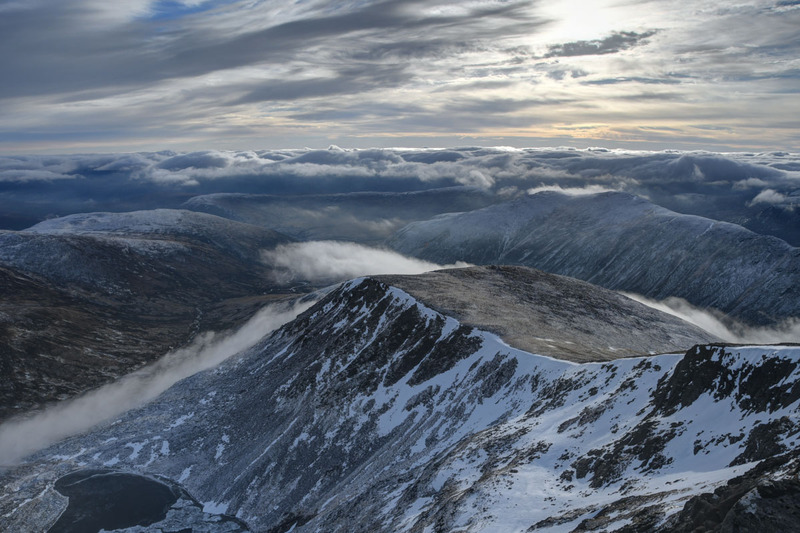 From the 1249m top there’s a cracking view down into Coire Sputan Dearg and Lochan Uaine. To the south we could just see Sgor Mor under the cloud. 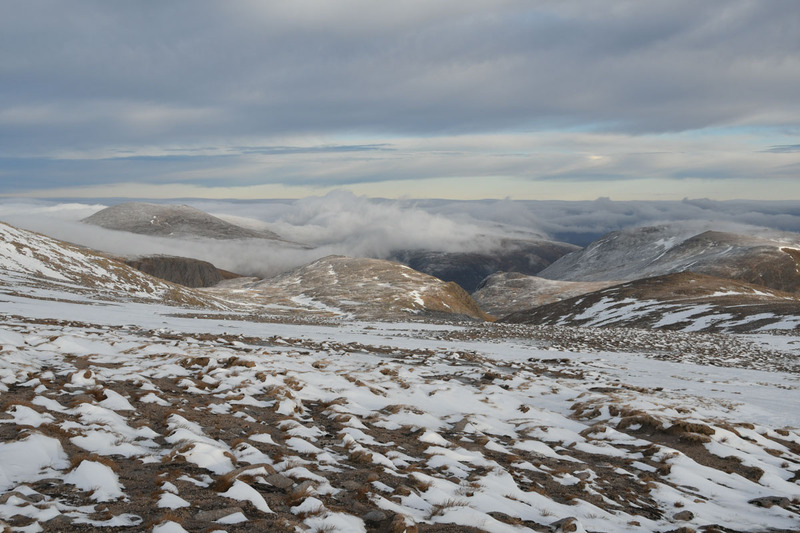 The cliff line NE leads on to Beinn Mheadhoin. 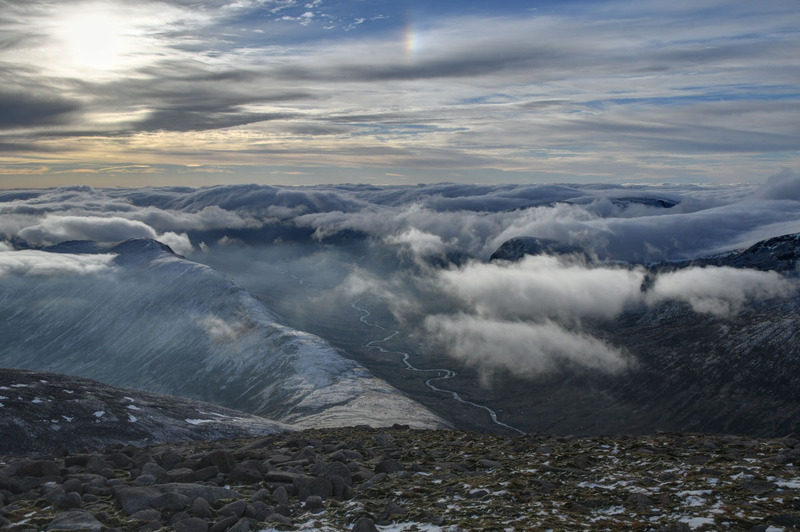 Started back, ascending Ben MacDui, the inversion was a little more sunlit over Bod an Deamhain and Beinn Bhrotain. In the distance Ben Lawers was just visible too. 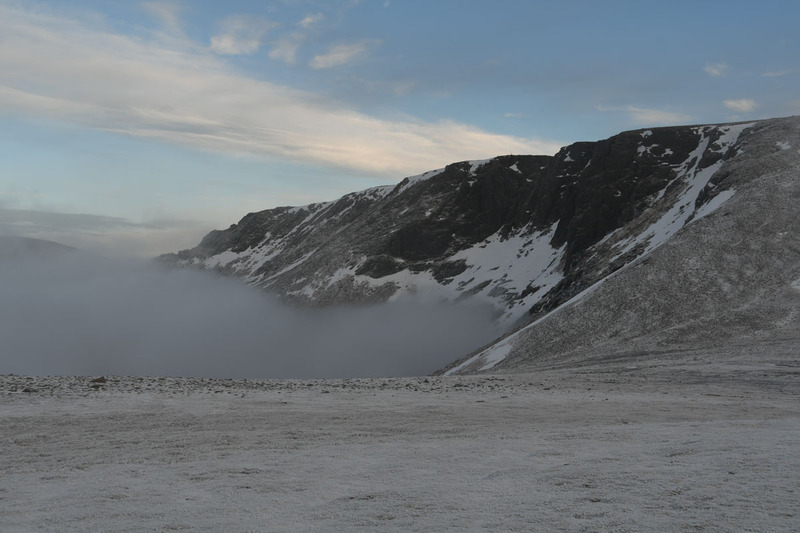 Over MacDui, the inversion had sunk a little and was now flowing southwards into the north end of Lairig Ghru. Carried on north heading back to the Northern Corries. Behind us the sunlit inversion was making it hard to leave. 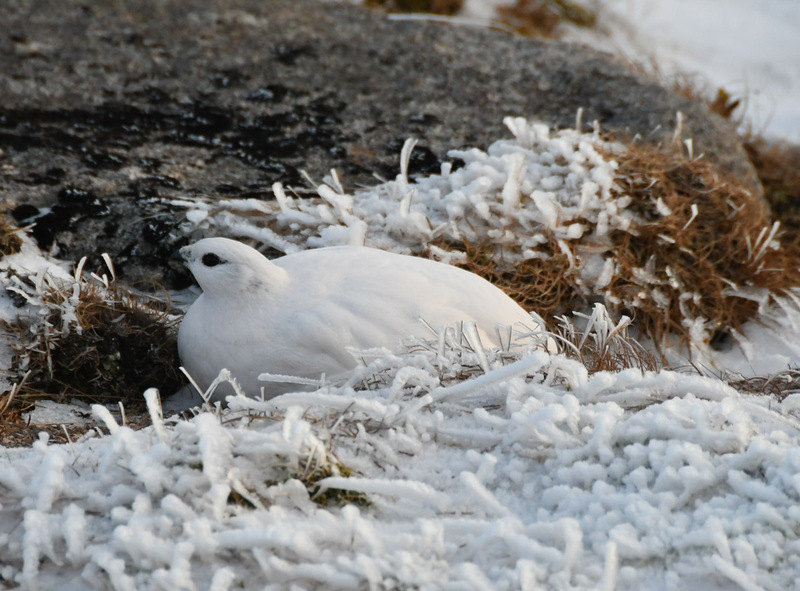 Finally came across a few ptarmigan on the west side of Cairn Lochain. 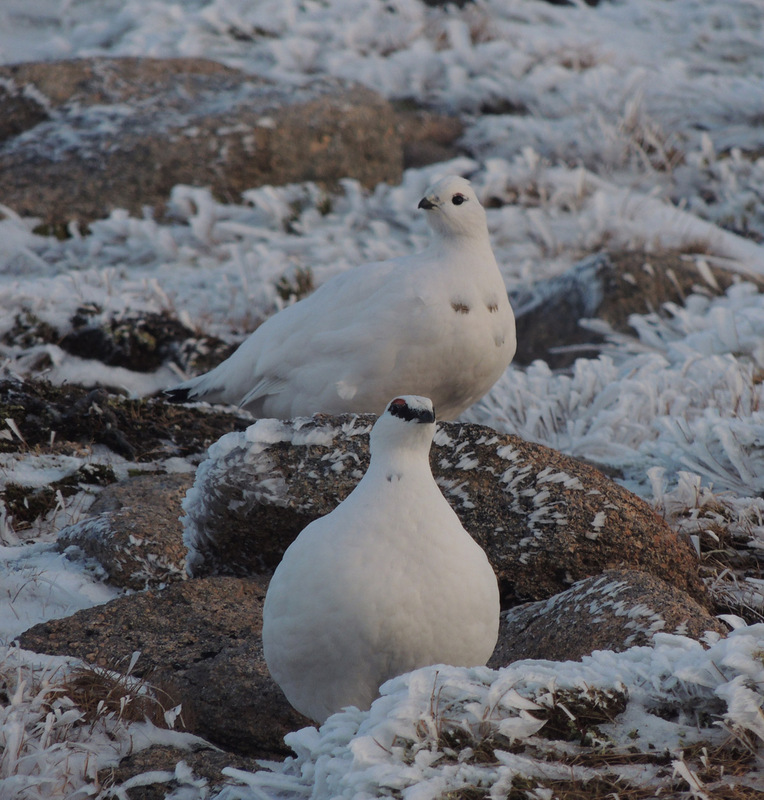 Now in their winter garb. 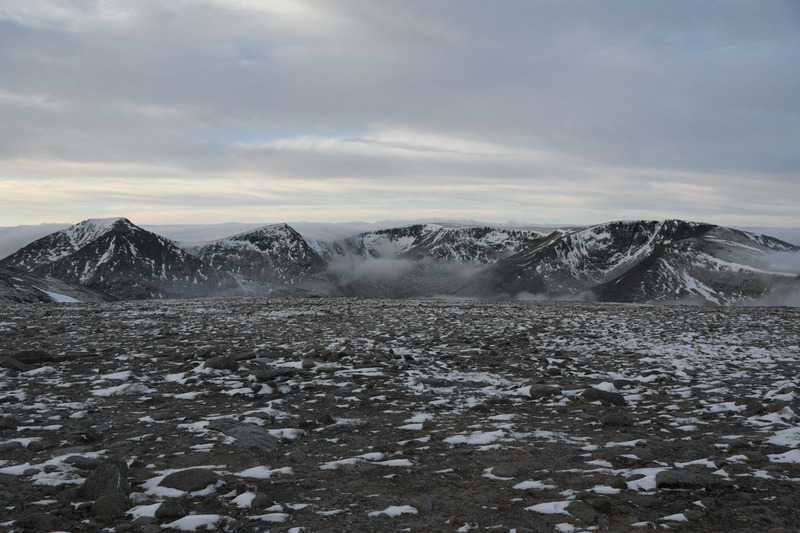 Cutting down to the 1083m point we diverted to our Lairig Ghru viewpoint – no view of the Pools of Dee today. 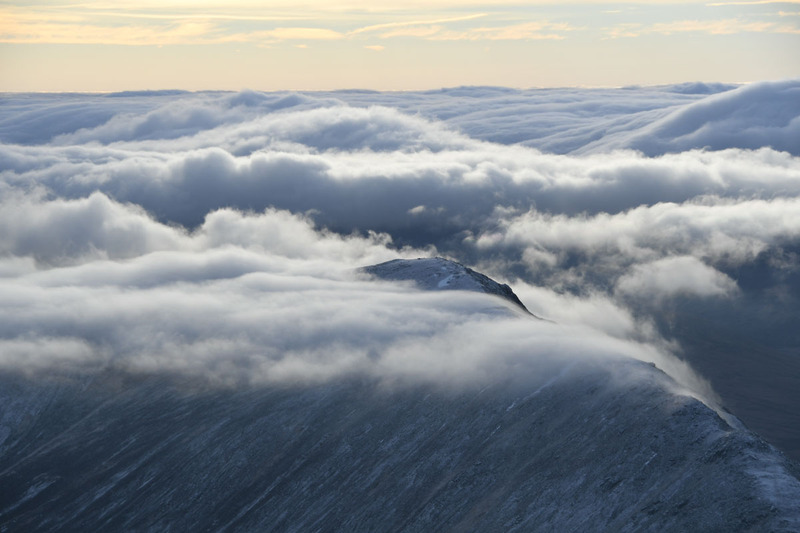 The cloud was creeping over the lip of Lairig Ghru towards Lurchers Crag like tendrils. Over the shoulder and a view of cloud lapping up to the cliffs. Then a quick yomp downhill and back to the car. A decent wander, the ‘Gorms are always a good bimble. Despite the lack of sunshine a pretty atmospheric day too. Another good trip , cracking conditions ..i love the Gorms . Must have just missed you, we were also on Macdui having come up from Linn of Dee. Cracking day to be out. 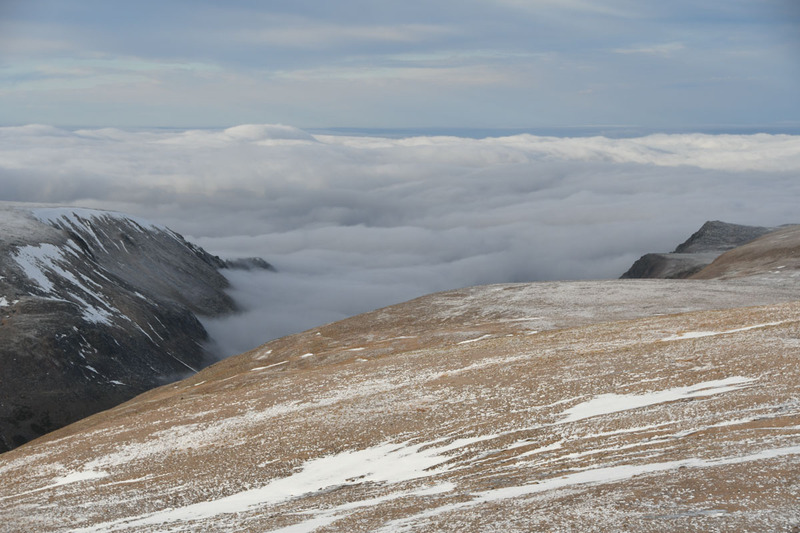 Yup, can’t resist a forecasted inversion. 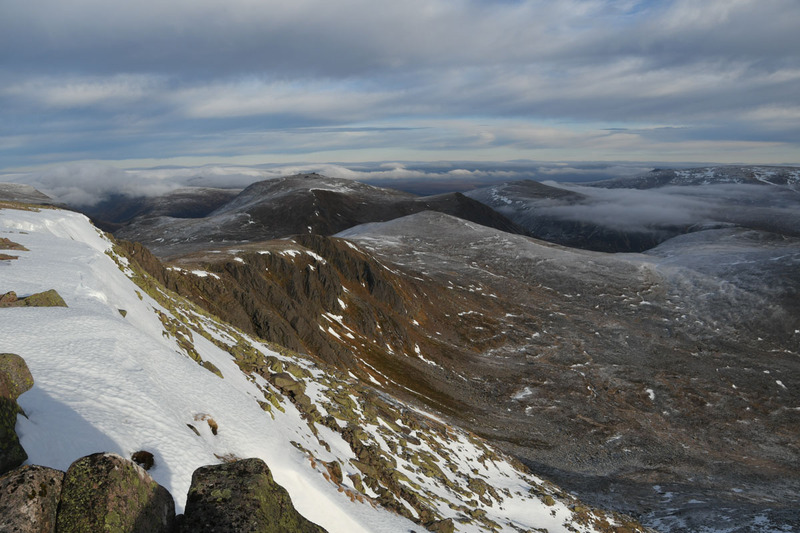 ← Binnein Mor and Na Gruagaichean, a forecast off the mark. 2nd January 2019.